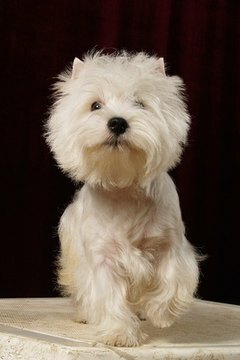 The West Highland White Terrier or “Westie” is recognized as part of the terrier group. The breed is particularly affected by skin allergies, as well as the more common food and flea allergies. These can be controlled with medication or diet changes. Flea allergies in Westies become apparent with uncontrollable scratching or biting at the legs. It's not the flea bite that the dog is allergic to but rather the flea saliva. This allergy can be remedied with antiflea medication. Westies can develop food allergies to ingredients in their dog food like wheat and corn. Food allergies can take the form of skin or gastrointestinal irritation and can only be controlled by altering the dog's diet. Atopic dermatitis can affect Westies and causes itchy skin and paw licking. It is the result of an allergic reaction to pollen, mold and dust mites. Atopic dermatitis is incurable but treatable with medication. Malassezia dermatitis is not an allergy but a yeast infection found on the skin of Westies as the result of an allergic reaction. The symptoms include loss of hair and oily, itchy, blackened, foul-smelling skin. Treatment includes anitfungal drugs, medicated shampoo, antibiotics, antihistamines and topical treatments. Contact with flea collars, soap, grass and nylon carpet can cause skin irritation and itching in some Westies. To prevent an allergic flare-up, owners should keep their pets away from the substances.